Video recommendation startup Taboola has been having quite a year, signing up major Web publishers such as the Huffington Post and the online editions of Bloomberg and The New York Times. The driving force behind the company’s continued traction is their Text2Video product. In fact, its most recent coup, Revision3, has seen a whopping 90% video uplift since adding Text2Video to their non-video pages. Adam Singolda, Taboola’s CEO, explained to me that while Taboola’s initial product was purely Video2Video recommendation, the company realized that although video CPMs are higher and publishers want more video views, most Web traffic is still mostly textual. Put simply, folks on the Web read much more than they watch video. To use Text2Video, publishers must also add the Video2Video module, allowing Taboola to crawl the publisher’s video inventory for title, thumbnail, description, etc. Then, the Text2Video module analyzes page content to offer video recommendations. 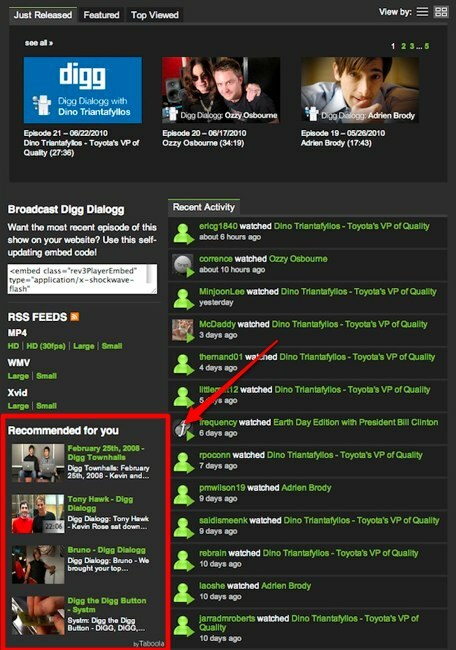 Revision3 saw a 90% uplift in video views when Text2Video was added to its non-video pages, such as DiggReel. 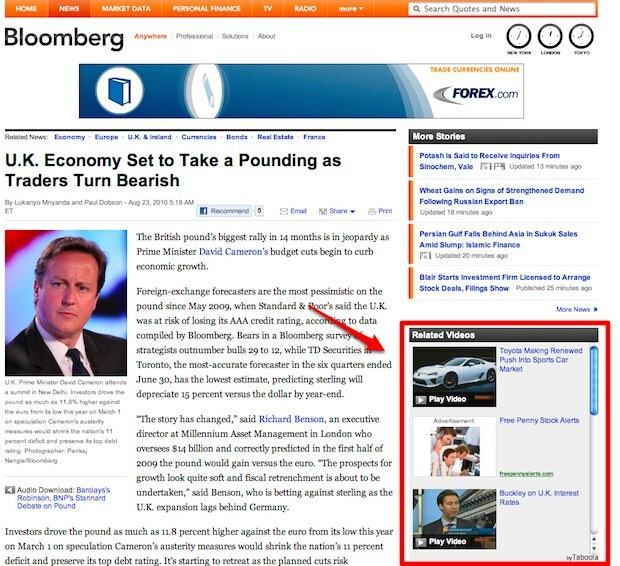 See it in action on Bloomberg.com as well, here. Singolda went on to explain that Text2Video’s ‘secret sauce’ is its ability to measure user engagement after the click on a video recommendation. This means that unlike purely contextual/semantic analysis solutions that can tell that page content happens to be about the iPhone, and consequently ‘pull’ iPhone videos, Taboola can tell that for iPhone page content, only short videos keep users on the site. Taboola can also determine that for iPhone page content, users are likely to be more engaged with off-topic videos (travel, for example). It seems the benefits of increased engagement and additional inventory publishers can monetize at higher CPMs are not falling on deaf ears. Taboola tells me that it’s now running on hundreds of millions of pages a month, doubling traffic every couple of months. Perfect timing for the video advertising ‘Frenzy Point‘ we recently wrote about. In general updates, since we last covered Taboola, the company has moved its headquarters from Israel to NYC. It has also brought on Lior Golan to run Product/R&D. Golan co-founded Cyota, which was sold to RSA for $145M. Liz Hughes also joined the company as VP Business Development. She previously held the same position at RealNetworks.